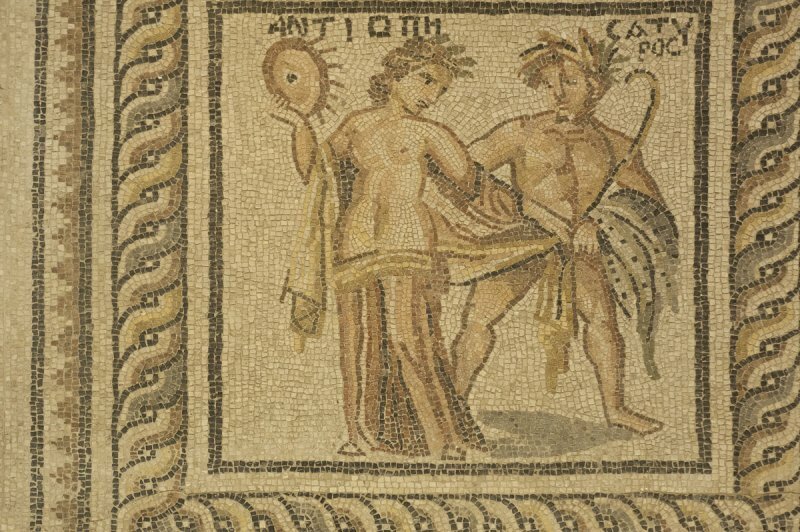 This seems to be another Antiope mosaic. Enc. Britt. about Antiope: in Greek legend, the mother, by the god Zeus, of the twins Amphion and Zethus. According to one account, her beauty attracted Zeus, who, assuming the form of a satyr, took her by force. Pregnant, she escaped the threats of her father by running away and marrying Epopeus, king of Sicyon; she was later brought back and imprisoned by her uncle Lycus. On the way back from Sicyon, or after escaping from prison, Antiope bore Amphion and Zethus, who were brought up by herdsmen. Later she joined them; they recognized her and killed Lycus and Dirce, his wife. Because of Dirce's murder, Dionysus, to whose worship she had been devoted, caused Antiope to go mad. She wandered restlessly over all of Greece until she was cured and married by Phocus of Tithorea, on Mt. Parnassus. Disguised as Satyros, Zeus attempts to seduce Antiope.